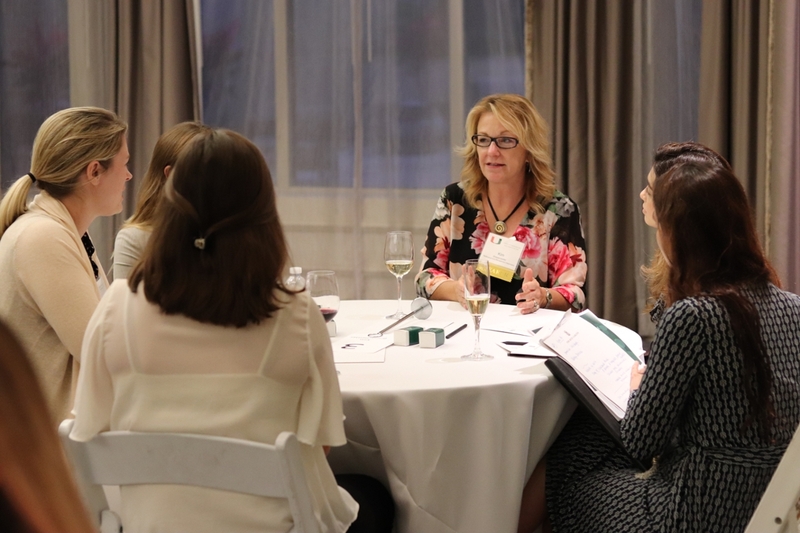 Jessica Brady, a Miami Business School senior, enjoyed getting real-world advice about a career in real estate development at "Cocktails and Conversations with Women Leaders in Real Estate," a multidisciplinary reception on April 3 at the Ritz-Carlton Coconut Grove. “This reception was a fun way to meet South Florida professionals and get their views on where the real estate cycle might be going,” said Brady. Another attendee, Emily Viera, BA ’14, wanted to get better acquainted with the commercial sector before starting her MBA program in May. “I’ve had some experience as an intern, and I’m here to learn more about taking the next step in real estate,” she said. More than 100 women and men attended the third annual reception, hosted by the University of Miami School of Architecture, Miami Business School and Miami Law. "This reception is one of the many ways we create opportunities for our students to grow their professional networks, get career advice, and gain a real-world understanding of real estate," said Andrea Heuson, professor of finance. Vanessa Grout, BBA '01, president, CMC Real Estate, and an advisory board member for the UM Master of Real Estate Development and Urbanism (MRED+U) program, welcomed attendees to the "speed networking" event, where groups of students moved from table to table for 20-minute conversations with different women professionals. Beth Azor, president and CEO, Azor Advisory Services, emphasized the importance of “shadowing” real estate professionals to learn about their roles, and then applying for internships in order to build a solid resume. Tere Blanca, president and CEO, Blanca Commercial Real Estate, advised students to find a mentor in real estate. “It’s important to have someone who can help you navigate this field and help you find an opportunity that matches your passion,” she said. Katie Sproul, CEO, Halstatt, Inc. The reception was sponsored by Hersha Hotels and Resorts, the Ritz-Carlton Coconut Grove and the Vagabond Group.